From the very earliest illustrated work of Charles Dangré in the 1920’s it must have been clear that ersatz bayonets would be extremely difficult to document. 50 years later in 1975 John Watts and Peter White published “The Bayonet Book”, that illustrates many different ersatz types. 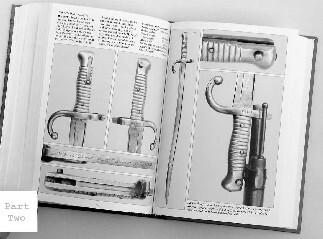 Followed one year later by Anthony Carter’s “German Ersatz Bayonets” showing detailed line illustrations of more than 90 bayonet variations and scabbard types. 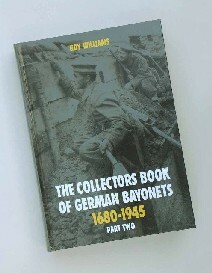 In 1995 Anthony Carter published “German Bayonets, Volume III” that lists recorded examples from EB1 – EB150. To avoid any confusion I have continued to use where possible, reference numbers with the prefix ‘EB’ created by Anthony Carter. Many bayonets are newly discovered examples where the muzzle ring has been removed or altered, with regimental/unit markings, these are listed as “variation” against the number. Since the year 2000 ersatz bayonets using obsolete socket blades have been regularly appearing from Afghanistan, both individually and in small quantities where they have been in storage since the 1920’s. Now with over 70 newly identified examples an ‘ES’ prefix has been created to replace the ‘EB’ numbers used by Anthony Carter. From the hundreds now recorded it has been possible to catalogue and identify many more rare and interesting variations by comparing the examples of the original socket bayonet with the ersatz blades. The bayonets and sidearms used by Germany during 1914-1918 from Asia, Europe & South America continue with the ‘EB’ prefix, these include many more very rare variations especially from Belgium & France. Where possible bayonets from all the groups are shown attached to the rifle and with contemporary troop photographs to authenticate individual examples. Limited Edition of 620 copies, A5 size, with hardback colour cover. 640 interior pages printed in black & white.